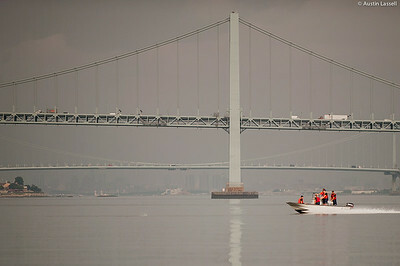 Several boats of the United States Merchant Marine Academy in Kings Point, New York residing in Hague Basin. 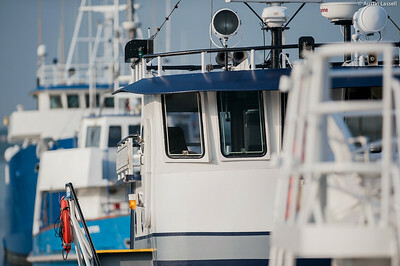 From nearest to furthest, Yacht Red Head, tugboat Elizabeth Anne, Training Vessel Liberator and Training Vessel Kings Pointer. 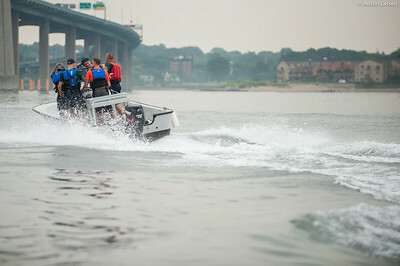 1st Company Platoon 102 candidates catching up on lost sleep on a Launcher during a small boats class on July 14th, 2014. 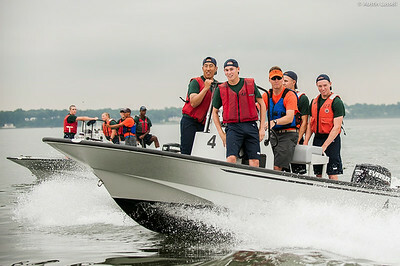 This candidate, and his other fellow candidates, are being given proper instruction in small boats maneuvering by Midshipman Andrew 3rd Classman. 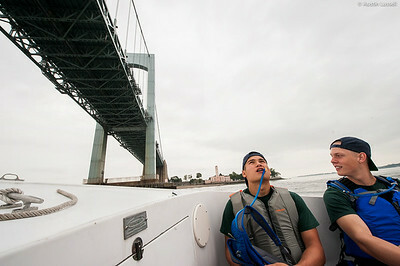 A 1st Company Platoon 102 candidate looking up as he passes beneath the Throggs Neck Bridge while riding on a Launcher headed to obstacle course training on July 14th, 2014. This candidate, and his other fellow candidates, are being led by Midshipman Andrew 3rd Classman. Midshipman Max Gaissle 1st Classman leads 1st Company Platoon 102 candidates in stretching prior to obstacle course training at SUNY Maritime College on July 14th, 2014. 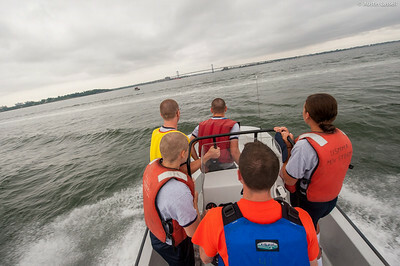 Midshipman Samuel Kevetter piloting a Whaler with 3rd Classman bringing United States Merchant Marine Academy 1st Company Platoon 102 candidates on board headed to obstacle course training at SUNY Maritime College on July 14th, 2014. candidates on board headed to obstacle course training at SUNY Maritime College on July 14th, 2014. 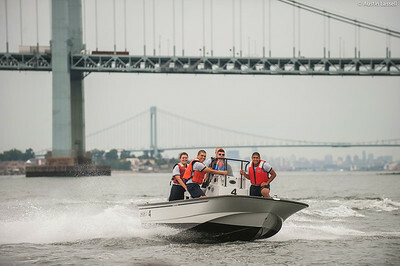 Midshipman William Lassell 3rd Classman performs maneuvers in a Whaler in order to teach 4th Company candidates proper instruction on the operation of a small boat during small boats class on July 16th, 2014. 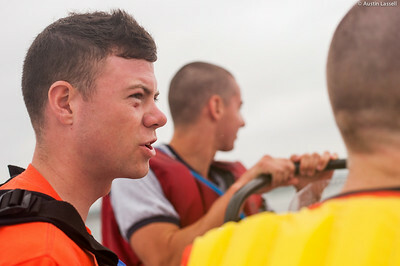 Midshipman William Lassell 3rd Classman speaks to 4th Company candidates concerning proper operation of a small boat during small boats class on July 16th, 2014. 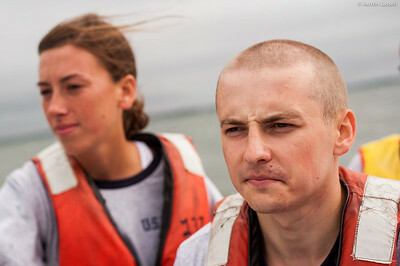 A 4th Company candidate pays careful attention while at the helm and follows the instruction of of Midshipman William Lassell 3rd Classman (not seen) during small boats class on July 16th, 2014. The Whaler is capable of considerable speeds, making careful maneuvering and navigation very important. 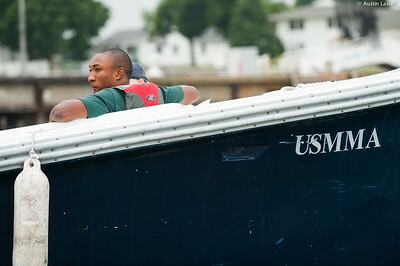 A closeup of the life jacket of a 4th Company candidate that reads "USMMA Waterfront" who is riding on a Whaler being piloted by midshipman William Lassell 3rd Classman during small boats class on July 16th, 2014. 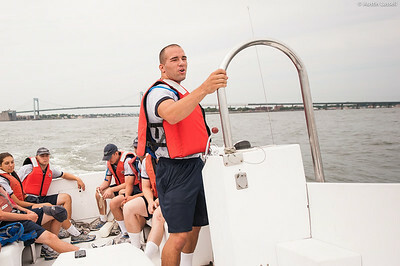 "Waterfront" at the Merchant Marine Academy refers to the docks that house Merchant Marine's boats in Hague Basin. 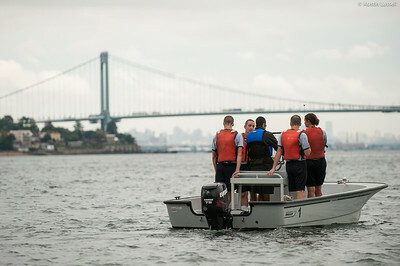 During each summer's Indoctrination of each new class, the Waterfront provides candidates with basic training concerning small boats and larger vessels. 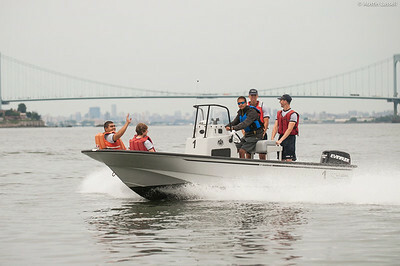 As compared to other Indoctrination training, Waterfront training is considered to be a nice change of pace, as while it is still full or responsibility, it includes the excitement of getting out onto open water. 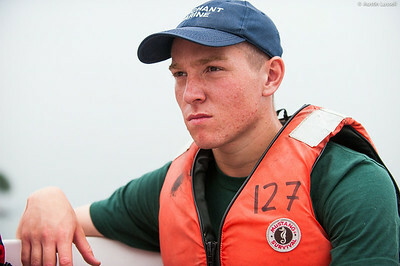 Midshipman Stephen Glass 2nd Classman speaks to 4th Company candidates on the operation of a small boat during small boats class on July 16th, 2014. 4th Company candidate operates the radio of a launcher at the instruction of Midshipman Nick Gioino 3rd Classman while returning to campus following obstacle course training at SUNY Maritime College on July 16th, 2014. 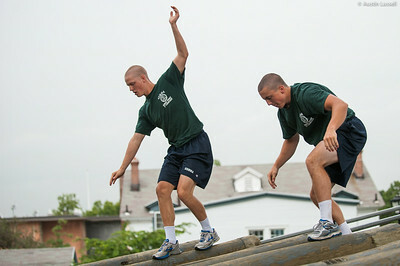 1st Company Platoon 102 candidates overcoming an obstacle during obstacle course training at SUNY Maritime College on July 14th, 2014. In this obstacle candidates must straddle down two metal bars. A 1st Company Platoon 102 candidate struggling to overcome an obstacle during obstacle course training at SUNY Maritime College on July 14th, 2014. On this obstacle candidates must get their body overtop the two bar seen quickly and safely out of contact with the ground. This obstacle is challenging in that it is difficult to carry out quickly and safely. 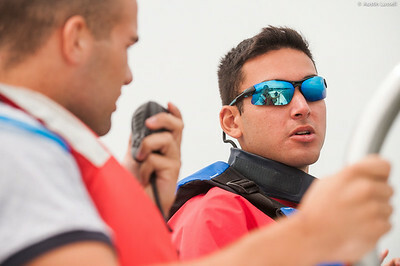 If several efforts are not successful, the candidate may have the assistance of their obstacle course teammate. 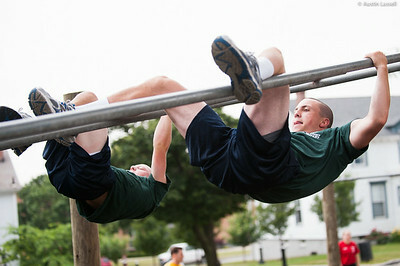 1st Company Platoon 102 candidates overcoming an obstacle during obstacle course training at SUNY Maritime College on July 14th, 2014. On this obstacle candidates must quickly get overtop the log while maintaining a low profile. 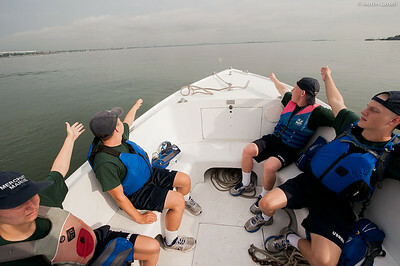 If several efforts are not successful, the candidate may have the assistance of their obstacle course teammate. 1st Company Platoon 102 candidates overcoming an obstacle during obstacle course training at SUNY Maritime College on July 14th, 2014. This is a simple workout portion of the course that takes place at the end of the course. The workout being performed is a "burpie", a pushup followed by a jumping jack, and must be done in several repetitions. 1st Company Platoon 102 candidate Morris being carried during a man down drill portion of the obstacle course during obstacle course training at SUNY Maritime College on July 14th, 2014. 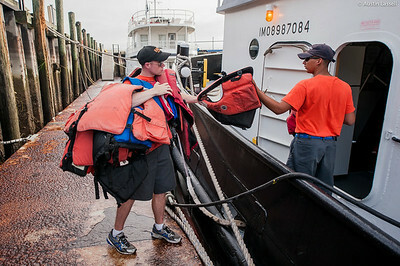 The purpose of this portion of the training is to test the candidate's ability at carrying a downed mariner. 1st Company Platoon 102 candidates overcoming an obstacle during obstacle course training at SUNY Maritime College on July 14th, 2014. On this obstacle candidates must get walk along a suspended log quickly and safely. This obstacle is challenging in that it is difficult to carry out quickly and safely. A 1st Company Platoon 102 candidate overcoming an obstacle during obstacle course training at SUNY Maritime College on July 14th, 2014. In this obstacle candidates must straddle down two metal bars.